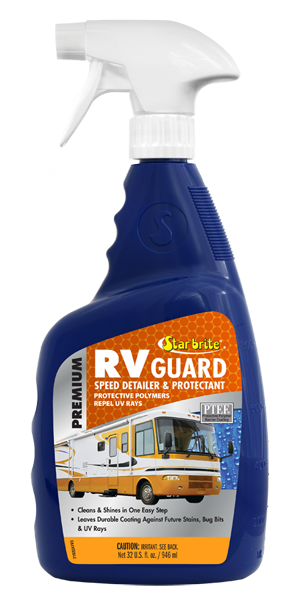 Star brite® Premium RV Guard Speed Detailer & Protectant uses high-tech PTEF® polymers that bond to painted surfaces, polished metal and fiberglass to add shine, enhance color and provide a barrier to UV damage. Safe for use on painted surfaces, chrome, stainless steel, aluminum, rubber, fiberglass and plastic surfaces. For best results, apply to surfaces that are cool to the touch. Spray onto surface to be cleaned and wipe using a soft cloth, rubbing lightly as needed on any deposits. Wipe up excess. Use as often as needed. For maximum protection of fiberglass, polished metal and painted surfaces, apply Star brite® Premium RV Polish with PTEF® annually.